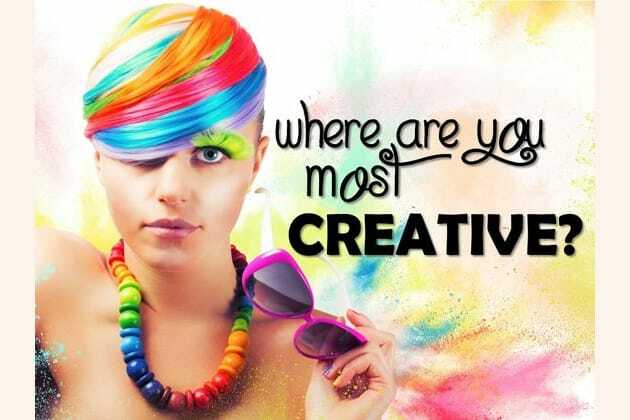 Can We Guess Where You Are The Most Creative? What do you remember most vividly about your first day of school? True or false: Children should be expected to take part in household chores. What’s bigger than you, but doesn't weigh anything? Are other people's opinions of your work important to you? What is the first verb that comes to mind when you see the word, "drum?" There's nothing like some time alone to really get your...err...juices flowing. I mean, who isn't totally brilliant in the bathroom? Whether you spend your bathroom time reading a book or checking up on social media, you know your brilliance is shining brightest once you leave that stall. The shower is the ideal place to have your deep thoughts, far away from other people. Feel those perfect water droplets hit your face and let your mind escape. In your own personal waterfall, you are the master! The wind hitting your face, your favorite song blaring on the radio, and you, captain of your own ship. You can go wherever you want, with only the open road to guide you. Your brilliance is boundless when you're driving! Just as your eyelids heavily close, you have a flash of inspiration! It happens to you all the time. You think your day is done, but your mind is still hard at work. Embrace it and you may come up with your best idea yet! You're not the type who needs quiet and solitude to think, your ideas are limitless when your coworker's droning voices are in the background. Who wants to listen during a boring meeting, when the things going on in your mind are so much more interesting? When your blood is pumping and you're body is feeling good, that's when inspiration hits you. When you feel the sweat dripping down your face you get into the zone. So lace up those sneakers and get creative! Do you get all your best ideas in the shower or on the drive home from work?